At the base of Bett Sistemi's working philosophy there have always been the quality of the components and the excellence of the systems made, so all the departments of the company operate in total compliance with quality procedures, environmental protection and safety in the workplace environment. The adaptation of the company processes to the main international standards such as ISO 9001: 2015, ISO 14001: 2015 and OHSAS 18001: 2007, confirm the ability of Bett Sistemi to supply high quality products and ensure their continuous improvement. To remain competitive on the markets, Bett Sistemi protects and enhances its resources, both structural and human, thus ensuring their durability and efficiency over time. The OHSAS 18001: 2007 certification obtained, certifies that Bett Sistemi complies with the requirements of the standard and confirms the adoption of a high level of control in the field of health and safety at work. 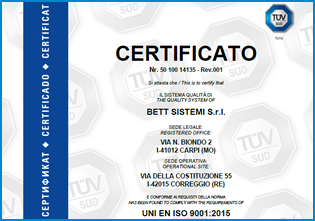 In recent years, Bett Sistemi has never compromised on the safety, compliance and quality of its products and systems, because quality is part of its organization, at all levels. 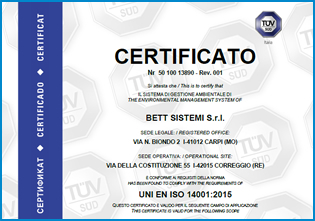 In September 2017 Bett Sistemi obtained from TÜV the renewal of the Quality Certifications pursuant to ISO 9001 and ISO 14001 standards, achieved for the first time in 1997 and 2003 respectively in collaboration with the major quality certification bodies. 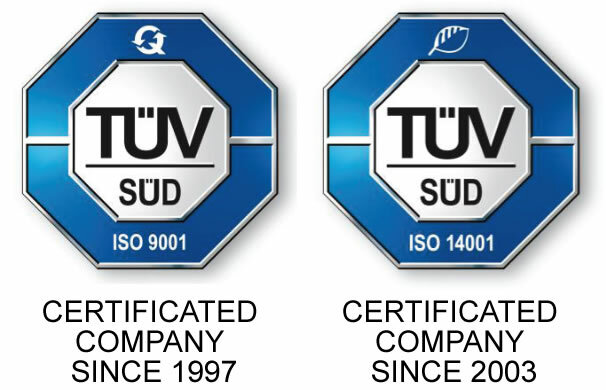 Through the control of the Technical Surveillance Office (TÜV), we are able to certify once more to our customers the conditions of safety and high performance provided by us. The renewal obtained demonstrates to our customers that the quality of the products purchased by us is not casual, but the result of strict observance of precise rules. 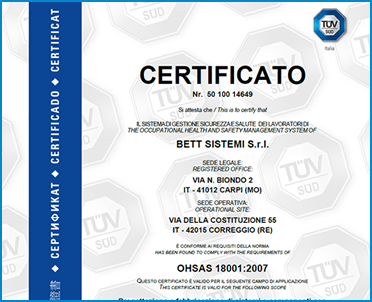 Bett Sistemi also undertakes to submit to the annual checks by the German Technical Surveillance Office (TÜV) in the future, so that the optimization process and the quality management system can be continuously improved to the benefit of our customers, precisely through the increase of the quality of the equipment, reduction of delivery times and prevention of errors. Our customers' satisfaction is a must for us. Bett Sistemi also receives for the year 2018, the sixth consecutive year, the CRIBIS Dun & Bradstreet "Rating 1" certification, which certifies the highest level of financial soundness. Issued by the CRIF SpA agency, world leader in the development and management of credit information systems, business information and credit solutions, the recognition is exclusively assigned to companies that guarantee high financial and economic reliability and full compliance with the terms of payment. This certificate confirms the solidity of Bett Sistemi and the efficiency of the management activity, which has always been oriented towards excellence, innovation and quality. 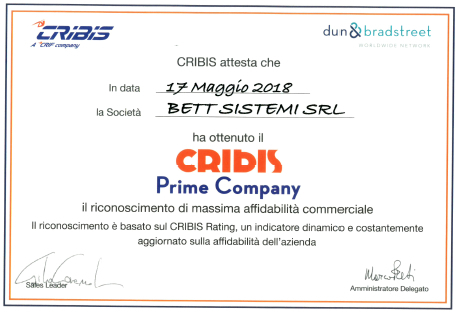 Cribis Prime Company, based on the CRIBIS D&B Rating, is the highest level of reliability assessment of a company and certifies the efficiency of the Management and Administrative Standards adopted by Bett Sistemi, to guarantee Customers, Suppliers and Partner Companies. CRIBIS D&B, part of the CRIF Spa Group, specializes in business information, providing the widest information on Italian companies and their payment behavior and over 250 million foreign companies thanks to membership in the D&B Worldwide Network. This important recognition is the confirmation of the level of economic and commercial solidity of Bett Sistemi and a guarantee for all the companies that have chosen Bett Sistemi as a Supplier. 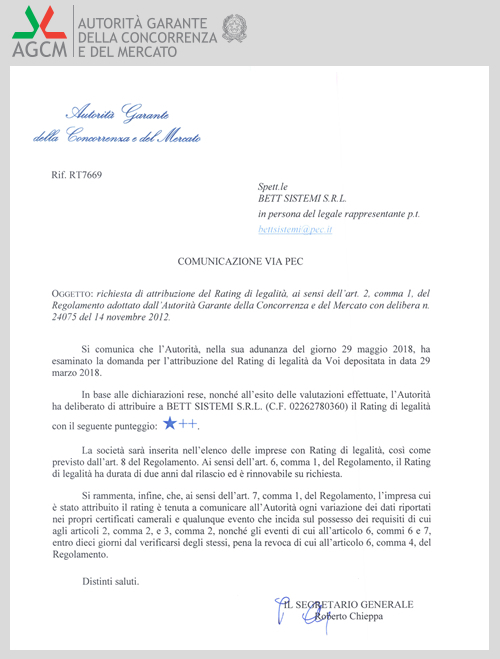 For the two-year period 2018-2020, Bett Sistemi obtained the Legality Rating by the Italian Competition Authority (AGCM), obtaining the score of one star and two plus signs. Bett Sistemi, which has been dealing with over 20 years of flexible automation, belt conveyance systems and machine safety, has chosen to obtain the legality rating because it believes it can be an ethical and voluntary tool, aimed at promoting the value of legality in the business environment. A valid system of bonuses for Bett Sistemi, which is committed to compliance with the law, trying to align its business activity with the highest ethical-social and governance standards. Total quality and customer satisfaction are the strategic objective and reference for all our staff. Our daily commitment to improving our products, services and processes is attested by our UNI EN ISO 9001 certification, maintained since 1997. In 2003, we took the further step of certifying our environmental policy to UNI EN ISO 14001. Since 2012 we have also been accredited CRIBIS D&B 1 for financial reliability.